, the son of George Pasor, a learned professor of divinity and Hebrew in the academy of Herborne, by Apollonia his wife, daughter of Peter Hendschius, senator of that place, was born there April 12, 1599. Discovering a very docile disposition, he was carefully educated in the elements of Greek and Latin in his native place, until the appearance of the plague obliged him to be removed to Marpurg in 1614; but the following year he returned to Herborne, and again applied himself closely to his studies. 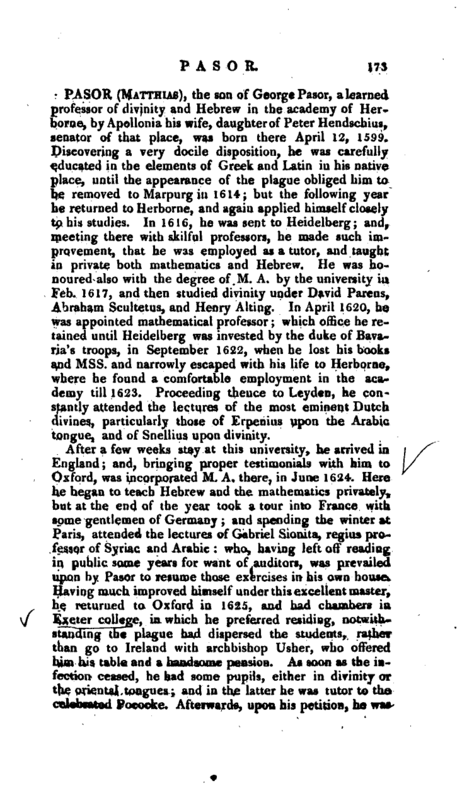 In 1616, he was sent to Heidelberg; and, meeting there with skilful professors, he made such improvement, that he was employed as a tutor, and taught in private both mathematics and Hebrew. He was ho* noured also with the degree of M. A. by the university in Feb. 1617, and then studied divinity under David Pareus, Abraham Scultetus, and Henry Alting. In April 1620, he was appointed mathematical professor; which office he retained until Heidelberg was invested by the duke of Bavaria’s troops, in September 1622, when he lost his books and Mss. and narrowly escaped with his life to Herborne, where he found a comfortable employment in the academy till 1623. Proceeding thence to Ley den, he constantly attended the lectures of the most eminent Dutch divines, particularly those of Erpenius upon the Arabic tongue, and of Snellius upon divinity. After a few weeks stay at this university, he arrived in England; and, bringing proper testimonials with him to Oxford, was incorporated M. A. there, in June 1624. 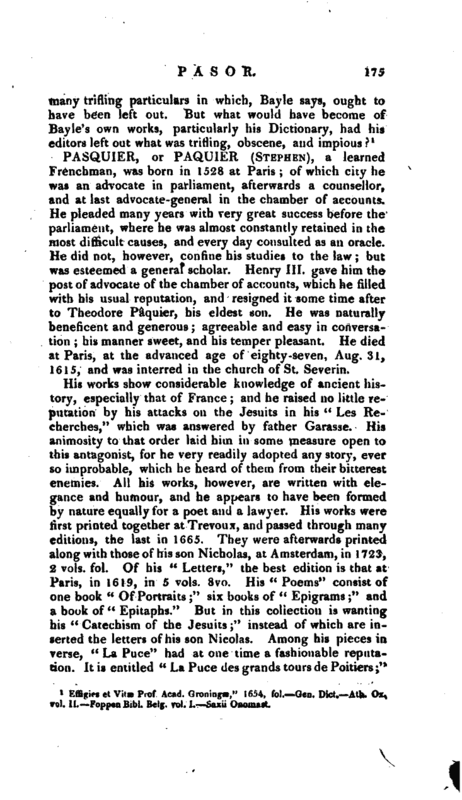 Here he began to teach Hebrew and the mathematics privately, but at the end of the year took a tour into France with some gentlemen of Germany; and spending the winter at Paris, attended the lectures of Gabriel Sionita, regius professor of Syriac and Arabic: who, having left off reading in public some years for want of auditors, was prevailed upon by Pasor to resume those exercises in his own house. Having much improved himself under this excellent master, he returned to Oxford in 1625, and had chambers in Exeter college, in which he preferred residing, notwithstanding the plague had dispersed the students, rather than go to Ireland with archbishop Usher, who offered him his table and a handsome pension. As soon as the infection ceased, he had some pupils, either in divinity or the oriental tongues; and in the latter he was tutor to the celebrated Pococke. Afterwards, upon his petition, he was | appointed to read public lectures in Arabic, Chaldee, and Syriac, twice a week in term time, in the divinity-school; for which he was handsomely rewarded. He held this temporary professorship for about three years from Oct. 1626, during which time he also delivered a Hebrew lecture in Now college. 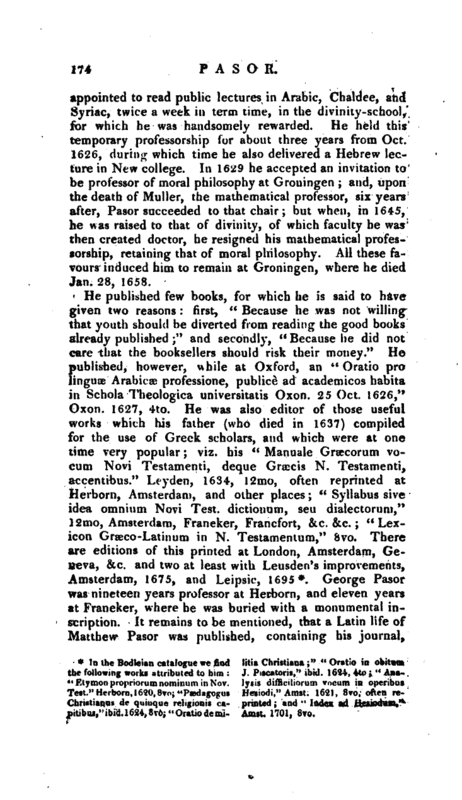 In 1629 he accepted an invitation to be professor of moral philosophy at Groningen; and, upon the death of Muller, the mathematical professor, six years after, Pasor succeeded to that chair; but when, in 1645, he was raised to that of divinity, of which faculty he was then created doctor, he resigned his mathematical professorship, retaining that of moral philosophy. All these favours induced him to remain at Groningen, where he died Jan. 28, 1658. In the Bodleian catalogue we find the following works attributed to him: “Etymon propriorumnominum in Nov. Test.” Herborn, 1620, 8vo; “Psedagogus Cliriftianus de quinque religion is capitibus,”ibid. 1624, 8vo; “Oratidemi litia Christiana” “Oratio in obit won J. Piscatoris,” ibid. 1624, 4to “Analysis difiiriliorum vocum in operibus Hesiodi,” Amst. 1621, 8vo, often reprinted and "Index ad Hesiodutn, Amst. 1701, 870. 1 Effigies et Vitae Prof Arad Gron’n? *," 1^* fol. Gn. l>ic '. vol. II. Fopptin Bibl. Belg. vol. 1. —Saxii Onomasticon.